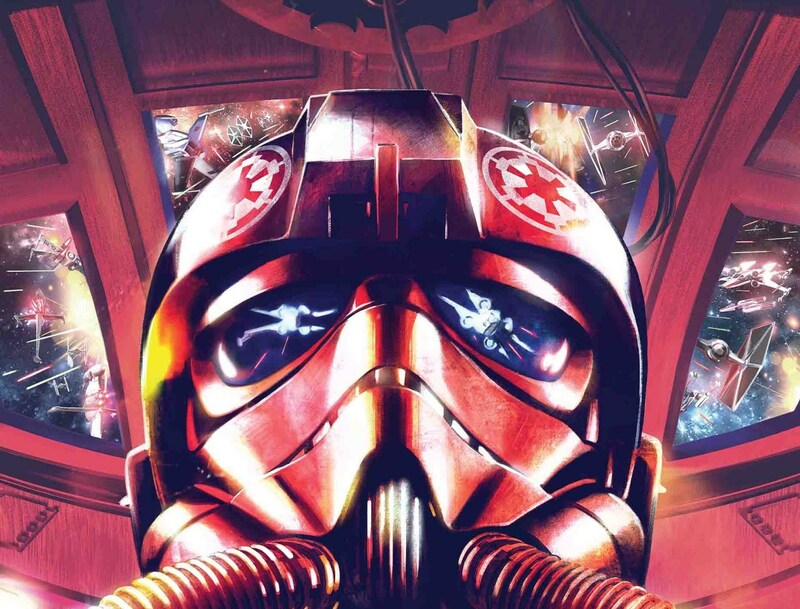 Star Wars: TIE Fighter #1 Review – AiPT! Marvel Comics is opening up the Star Wars comic universe of late be it a pre-Return of the Jedi Leia story last week or TIE Fighter #1 out this week taking place post the Battle of Hoth. For the most part, the comic series so far have taken place after Episode IV and it’s exciting to see new stories exploring new eras. Jody Houser and Roge Antonia are taking us on a new kind of adventure on top of that thanks to its focus on the enemy of the Empire, but are they so bad? This series also ties into the upcoming companion novel Alphabet Squadron. Get a taste of what is to come in the post Return of the Jedi pre-Force Awakens universe here! Oh no the bad guys are on their tail! This issue does a great job introducing readers to a very different side of things. Opening with a dogfight we witness TIE Fighters take out a Rebel ship and soon discover the heroes of the story are the ones killing the Rebels. As the story carries forward we meet the various pilots, their direct commander, and the commander of the Star Destroyer they’re positioned on. Anyone who follows “The Empire did Nothing Wrong” mantra is going to love this. The characters are doing what they think is right (supporting who they believe to be the good guys). There’s a good introduction of a character who may not believe what they’re doing is right as well and there’s an interesting internal struggle for that character to follow. This issue also sets up a wild conflict to overcome by the end. Houser establishes a very different Empire in its current state. They aren’t supreme rulers but stretched thin across the galaxy. That leaves the characters here in a vulnerable place and establishes they are underdogs fighting against all odds. It further puts into focus how great they have to be to stay alive in their dogfights. The art by Antonio and colors by Arif Prianto, with Michael Dowling and Lee Loughridge drawing a back matter after credits scene, are solid. Let’s be honest, we all came for the TIE Fighter dogfights and this book makes the ships look gorgeous. The color and texture of planets and space backgrounds help add depth to the battles too. In fact, space backdrops have much more color than we’re accustomed to from the films, but it looks great. Explosions, blaster rays, and the swooping engine lights all look fantastic too. Characters look sharp too as both art teams do well to capture the emotions of the pilots. Oh, wait. Who are the good guys? The only element that threw me off which others might not mind is the Star Destroyer commander Nuress going by Grandmother. I imagine a nickname is totally feasible, but that moniker seems a bit too family related for the Empire. It gives the impression they are a family, which seems counter to how we’ve seen the Empire and how they manage their cannon fodder soldiers. I had a blast with Star Wars: TIE Fighter and I think most will too. It gives readers a new flavor in the pantheon of Star Wars stories and has the opportunity to tell a very different story. One that could lead to surprising places. Star Wars: TIE Fighter highlights how good people can be found on both sides of a war.